The object of the game is to be the first player to get rid of all of your cards. 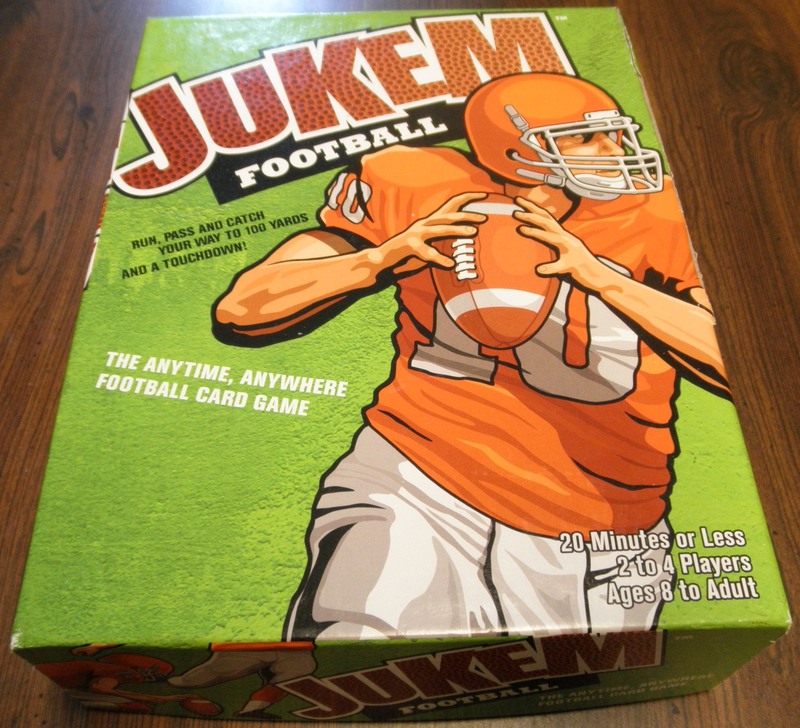 To begin the game all players get seven cards. The top card of the deck is then placed in the discard section of the gameboard (if it is a wild, terrible 10, or card attack a new card is picked) and the rest of the cards are placed in the machine. Each turn a player begins by playing a card that matches either the color or number of the card currently at the top of the discard pile. Players can play additional cards in two different situations. Any additional cards of the same number as the top card in the discard pile can be played. For example if the top discard is a red six; a green, gold or purple six can be played as well. If the player has multiple sixes they can play all of them in their turn. Any additional cards that are in numerical sequence and are the same color as the current card can be played. For example if the top card on the discard pile is a five green card, the player can play a four green then a three green and so on. The player also could play a six green, seven green and so on. The player is unable to play cards in one direction and then switch to the other direction. 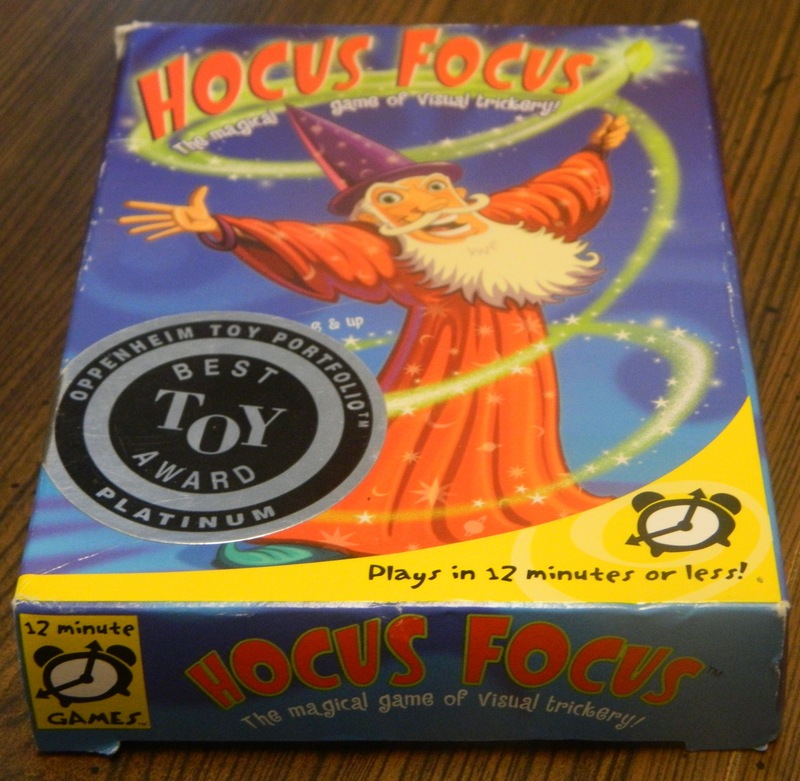 For example the player would be unable to play a four green on the five green and then play another five green on top of the four green. In the picture above, the specialty cards pictured are from left to right: Terrible 10, Wild, and Card Attack. Terrible 10s-Play moves to the player to the left. If they are unable to play a terrible 10 card of their own they need to push the button on the machine. If cards start shooting out, the player needs to press the button again in order to stop the cards from shooting out. The player needs to keep all of the cards that shoot out of the machine. If the player plays a terrible 10 or no cards shoot out of the machine, the machine proceeds to the next player who either needs to play a terrible 10 or press the button. This continues until the machine shoots out cards to one of the players. Terrible 10s act as 10s when playing cards to the discard pile for runs and matching cards. If the terrible 10 is your last card and it matches the color of the discard pile it is played like normal. If it does not match you play the card and press the button 10 times. Card Attack-You get to pick another player who will receive cards. You get to keep pressing the button until cards start shooting out. The other player is then able to try and shut off the machine as quickly as possible. The player that the card is played against has to keep all of the cards that shoot out. If your last card is a card attack and you are unable to play it normally, you need to play it on yourself and you will get the cards that shoot out. Wild-You get to change the color to any color you choose. You are unable to play any other cards during your turn. If a player is unable to play any cards during their turn, they may discard any numbered card but they must press the button as many times as the number on the card. If the machine goes off, the player doesn’t need to keep pressing the button. When someone has played all of their cards, the other players get points equal to how many cards they have remaining. After a predetermined number of rounds, whoever has the least amount of cards is the winner. 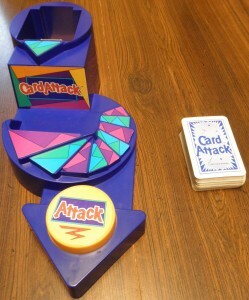 When looking at Card Attack it is impossible to not make the comparison to the game UNO. 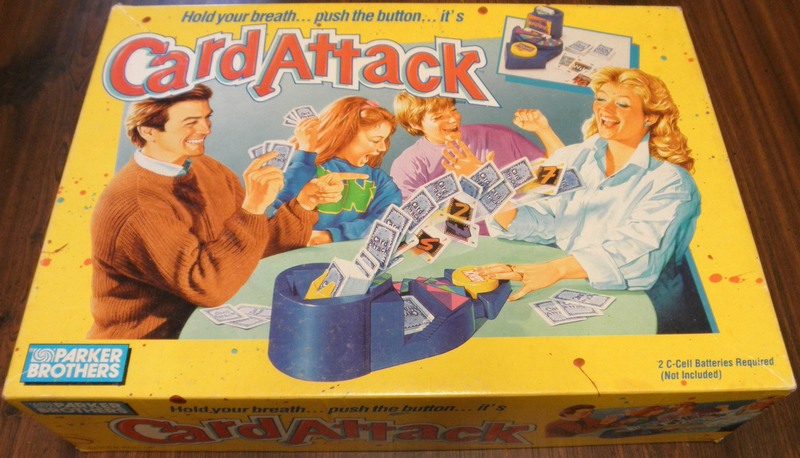 Card Attack borrows heavily from games like UNO and Crazy Eights. The majority of the cards in the games are numbered cards in different colors. You play cards that either match the color or number of the top card on the discard pile. Whoever gets rid of all of their cards first is the winner of the round. Simply put if you are familiar with UNO you pretty much already know what you will be getting out of Card Attack. I mostly decided to give Card Attack a chance since I would consider myself to be a fan of UNO. The game is far from strategic but it makes up for that by being a quick pick up and play game. When comparing Card Attack to UNO there are only two real main differences. The first and most obvious difference is the addition of the card machine and the cards that require you to press the button on the machine. The card machine had potential to add a unique twist to UNO. Unfortunately in my opinion the card machine doesn’t really add a lot to the game. The problem with the machine is that it takes too long to start shooting out cards. On top of the machine taking too long to shoot out cards, you will always know ahead of time if cards could come out so you should always be alert and ready to press the button. Unless you have a terrible reaction time, you will get only a few cards from the machine at a time. You could easily not get any additional cards which occurred several times in the game I played. I have not played UNO Attack before but it appears to be very similar to Card Attack. Maybe UNO Attack’s card machine works better. The other major addition to the game is actually an improvement to the game of UNO in my opinion. I actually liked the ability to be able to play multiple cards on a turn. I believe this adds some strategy (not a lot but some) to the game of UNO. UNO doesn’t really have a lot of strategy so that is a positive. 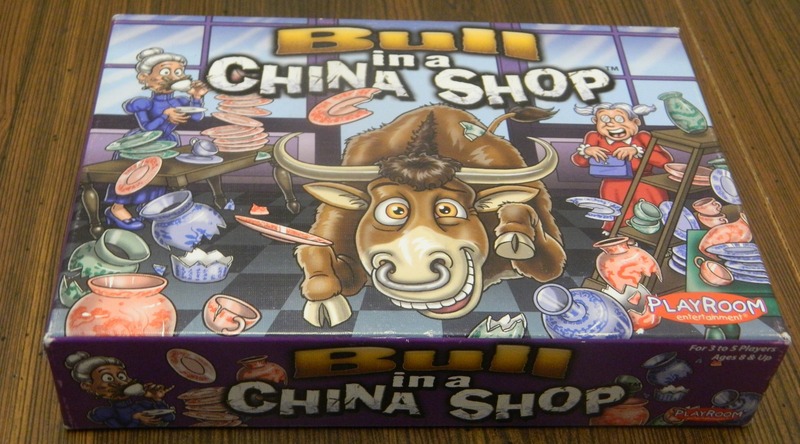 While I like the multiple card rules, the instructions for the game do a poor job of explaining them as I had to look over the rules multiple times before I understood what extra cards could be played each turn. I am guessing that there is already a variant to the rules of UNO that allows players to play several cards on a single turn. Overall Card Attack is not a terrible game but it is also far from original. The card machine was supposed to add something new to UNO but it fails too since it is too easy to avoid having to take any additional cards. The only real addition is the ability to play multiple cards on a turn but I don’t know if that really justifies picking up Card Attack. I think finding a variant to the UNO rules that allows multiple cards to be played on a turn would be a better use of your time. If you don’t like Uno you will not like Card Attack since it is essentially the same game with some slight rule alterations. If you like UNO I would only recommend the game if the card machine concept interests you since pretty much everything else the game offers can be incorporated into a game of UNO with some rule variations. Being able to play multiple cards on the same turn adds strategy to the game of UNO. Close to a clone of the game UNO. The card machine concept fell flat for me.